This application is a blessing for the computer users, as it helps in the scanning of the computer and removal of viruses and other malware that are destroying the data and the health of the system. You can scan your hard disk for all the possible problems. McAfee Stinger is a portable application where there is no setup required, and you must not expect any changes in the registry files. The application generates some additional file on the computer, which are the logs containing the information about scans and the details figured out in each scan. The interface of McAfee Stinger is user-friendly and neat to let you find the desired functions of this utility. You can run the default scan of your computer or can customize it according to your needs. Moreover, it is updated multiple times a week to the threat library updated for providing better protection for your computer. The description for the scanned files, the overall time required for scanning and the threats that and cleared are all provided to you, so you can evaluate the performance of this application and analyze the level of risk to which your computer is prone to. 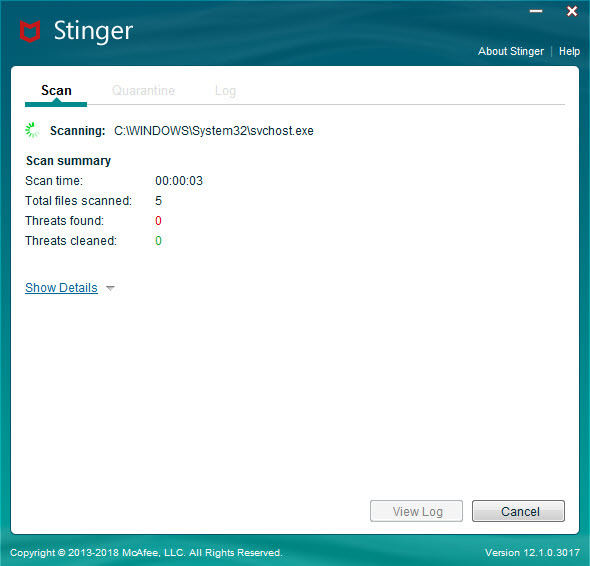 McAfee Stinger is a lightweight and portable scanner to provide your computer with a scan so that you can get rid of virus and malware.